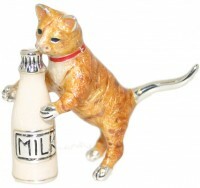 Saturno Silver animals - Page 22 of 23 - Connard & Son Ltd.
Saturno sterling silver and enamel Cat clutching a bottle of milk, with orange marmalade enamelling. Highly detailed piece. Made in Italy to the highest standard, finished with a protective lacquer to prevent tarnishing with no need to clean. They make ideal gifts and are highly collectable. 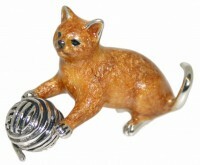 Saturno sterling silver and enamel cat playing with ball of wool, with light brown enameled body and silver ball of wool. Highly detailed specimen. Made in Italy to the highest standard, finished with a protective lacquer to prevent tarnishing with no need to clean. They make ideal gifts and are highly collectable. Saturno sterling silver and enamel cat with orange marmalade body sat upon a red enamelled silver padded chair, with webbing under the chair and large tapered legs. 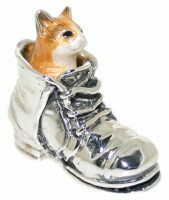 Saturno silver and enamel Cat in boot. Enamelled cat in orange marmalade sat inside silver walking boot. Highly detailed specimens. Made in Italy to the highest standard, finished with a protective lacquer to prevent tarnishing with no need to clean. They make ideal gifts and are highly collectable. 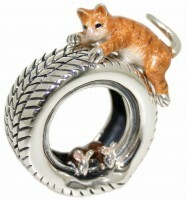 Saturno sterling silver and enamel cat, mice on ladder, orange marmalade cat lying on detailed tyre chasing 2 brown enamelled mice on inner. Highly detailed pieces. Made in Italy to the highest standard, finished with a protective lacquer to prevent tarnishing with no need to clean. They make ideal gifts. 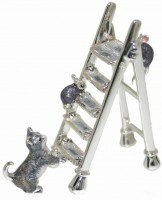 Saturno sterling silver and enamel cat, mice and ladder, blue marmalade cat chasing 2 mice up the old style ladder. Highly detailed pieces. Made in Italy to the highest standard, finished with a protective lacquer to prevent tarnishing with no need to clean. They make ideal gifts and are highly collectable.